Whether your prefer to proudly fly your colors with one of our patriotic tees or show off your expertise with one of our tactical logo t-shirts, 5.11 offers a wide range of clear, crisp, and comfortable tees that allow you to express yourself loud and clear. 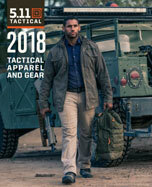 Great for both casual wear or for use as a bottom layer, 5.11 Tactical t-shirts are crafted from pure, premium, 100% cotton fabric for unbeatable comfort and all day breathability. Sturdy enough for camping or fishing but comfortable enough to wear around the house, 5.11 t-shirts are available in a full range of colors, sizes, and styles to suit any preference.